#life #work #giving - it's a WE thing! Choose Service, Day & Time. 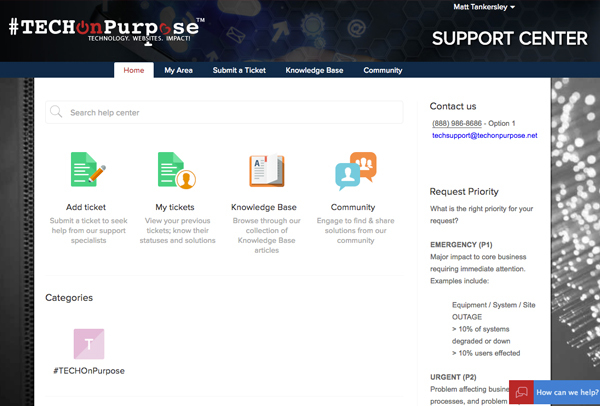 Visit our Support Center to find helpful tips, browse the Knowledge Base, or review old tickets. You can open a new support ticket, or even chat live with a member of our support team. All the help you need – all in one place! a division of HumaniTV, Inc.
TechOnPurpose is a #trusted technology partner in the shared pursuit of a better tomorrow together! We provide our clients with unmatched service and a comprehensive suite of IT, cabling, cloud and professional services. We deliver globally, on site, on demand and on a mission as #trusted servants to our clients and communities.